I've gotten a couple more questions from readers re the new MSR PocketRocket 2. I'll list the questions and my responses, below. Since this is Review Supplement #2, yes, there is a Review Supplement #1. Q. Can an MSR PocketRocket 2 fit into a MSR Titan Kettle (850 ml capacity) along with a 110 g canister of gas? A. Yes, it fits just fine, no trouble at all. It fits right inside; the kettle's lid closes tightly; you don't even have to take the lid off the canister. Q. Can an MSR PocketRocket 2 fit into an Evernew 600 ml pot along with a 110 g canister of gas? A. Uh, no. Not even close. A 110 g canister of gas and an MSR PocketRocket 2 cannot both fit inside an Evernew 600 ml pot. Interestingly, you can fit a canister – just the canister – inside the pot if you a) take the cap off the canister, and b) turn the canister upside down. One can fit a 110 g canister of gas inside an Evernew 600 ml pot, but you have to turn the canister upside down. The dimple in the pot's lid will fit into the concave base of the canister. OK, that's it for today, short and sweet. Backpacking gas canisters are for backpacking and car camping canisters are for car camping, right? Well, yes, generally that's true – but not if you have a G-Works adapter. A G-Works propane adapter connects a backpacking stove to a car camping type 100% propane canister. A G-Works adapter screws on to the top of an everyday ordinary Coleman type 100% propane canister, the kind that are used for car camping, picnics, BBQ's, etc. The other side of the adapter is a 7/16" UNEF threaded connector – just like the one on the top of a backpacking type gas canister. You screw in 100% propane on one side of the adapter and your backpacking stove on the other, and, voila! – you're cooking on 100% propane. 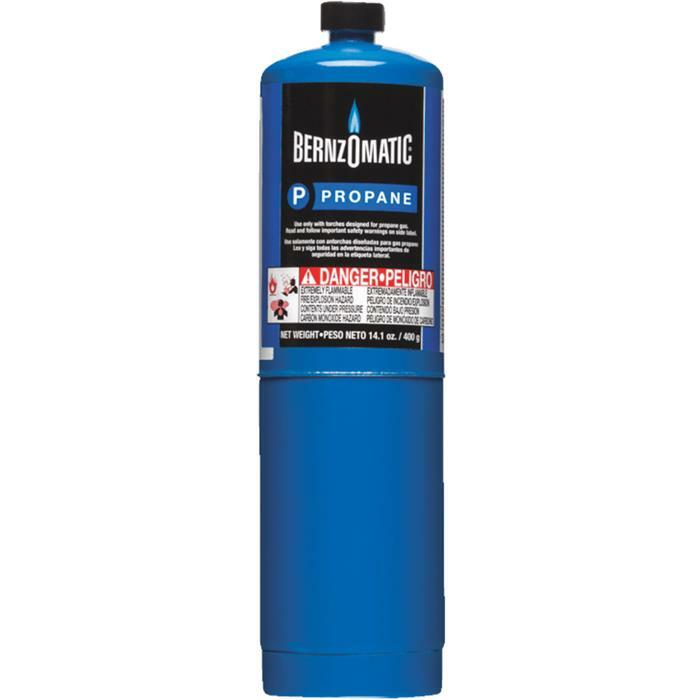 Now, the big 16.4 oz/465 g 100% propane canisters are pretty heavy and bulky. Why use them? Well, see my list of reasons, below. However, note, that there are a lot of techniques and technologies that can help you use regular backpacking canisters in cold weather; see Gas Stoves in Cold Weather – Regulator Valves and Inverted Canisters. You can also use a liquid fueled stove in cold weather. This adapter is just another option. Each person should evaluate his or her own circumstances and preferences and choose accordingly from among the options. Regarding the weight of the 100% propane canisters: I have a couple of Coleman brand 465 g canisters of 100% propane in front of me. They weigh about 850 g each. The weights vary, but the lowest I've seen for a full 100% propane canister is about 840 g. By contrast, a 450 g Jetboil brand backpacking type canister weighs 660 g. That's a minimum difference of about 80 g (roughly 3 oz) for comparably sized canisters. Some Coleman 100% propane canisters weigh 870 g. That's about about 110g (about 1/4 pound) more than a comparable backpacking canister. Is the weight worth it? Well, that's something you're going to have to decide for yourself. Read the rest of the post and see if benefits are sufficient to justify the weight of the heavier canister. Now, remember, the vapor pressure of propane is WAY HIGHER than a normal backpacking canister. Start on low, and open up gradually the valve on your stove. This is a big boy/big girl, grown ups only, type adapter. There's no built in safety. YOU are the safety. In order to operate this safely, you have to control the gas flow with the valve on your stove. Turn it up too high, and you might blow out the flame. If the flame goes out, you've now got a highly flammable, potentially explosive gas rushing toward the red hot metal of your stove. I'm thinking maybe that's not such a good idea – if you get my drift. So, BE CAREFUL. Also, DO NOT tip the canister over. The canister needs to be upright. If you lay the canister on it's side, you're going to be feeding liquid fuel into the burner instead of gaseous fuel. Don't lay the canister on its side UNLESS you've a) got a remote canister type stove with a generator (pre heat device) of some type and b) your stove is good and hot. If you don't know what a generator or pre heat device is, don't lay the stove on its side! You could get a huge yellow fireball. This is highly dangerous. Don't do it. Not recommended for regulator valved stoves above 40 Fahrenheit/5 Celsius. If your stove is equipped with a regulator valve, I would not use this adapter in cool, warm, or hot weather. Why? Well the regulator in your valve is not built to handle the high pressure of propane. Can your stove's regulator handle the high pressure of propane? I have no way of knowing – so don't do it. If you use 100% propane on a regulator valved stove, you could damage the regulator. If the regulator fails, how are you going to control the flow of gas? I'm not sure exactly what would happen if your regulator failed while your stove was lit, and I don't want to find out. Of course, in colder temperatures, high canister pressure is hardly a problem. At temperatures around 40 Fahrenheit/5 Celsius, 100% propane has roughly the same vapor pressure as an 80/20 isobutane/propane mix at 110 F/43 C. Your stove should be able to handle such pressures. You should be pretty safe so long as you start with the stove on low and turn it up slowly. Particularly below freezing, a regulator valve equipped backpacking stove should be fine. However, note the effects of altitude. The pressure inside the canister relative to the outside air will become greater at higher elevations. For every 1000 feet in elevation gained, you should deduct 2 Fahrenheit degrees from my 40 Fahrenheit estimated safe temperature limit. That would be about 1 Celsius degree for every 300 m. For example, at 10,000, instead of a 40 Fahrenheit safe limit, you would want to not operate a regulator valve stove above 20 Fahrenheit. The vast majority of stoves do not have a regulator valve, but you should check with your manufacturer as to whether or not your particular stove has a regulator valve. Here are some stoves with regulator valves. Do not use this adapter with these stoves in cool (above 40 F/5 C), warm, or hot weather. Use only in cold weather (below 40 F/5 C). That's all the regulator valved backpacking type stoves I can think of off the top of my head. Remember to check your stove to see if it has a regulator valve before using this adapter. Usually it will say on the manufacturer's website if a particular stove has a regulator valve. Why 100% propane? Well, for starters, cold weather. Butane, which is often the majority component in backpacking gas canisters, vaporizes at 31F/-0.5C. That's really not all that cold. Not only that, but you have to be about 20 Fahrenheit degrees (10 Celsius degrees) above the vaporization point before you have consistently good pressure. Propane on the other hand, vaporizes all the way down to -44 Fahrenheit/-42 Celsius. That's cold! And yes, I know they usually blend in some isobutane and propane into the typical backpacking gas canister, but still, nothing beats 100% propane for cold weather. The "other" might include methane, ethane, isobutane, butane, etc., some of which will give you less performance in cold weather, others of which will give you better performance. So, the number -44F/-42C is something of an approximation, depending on exactly what you've got in the canister. Still, 90% minimum propane is going to be significantly better than any backpacking canister's mixture which is typically no more than 30% propane. And remember that you need to be about 20 Fahrenheit degrees (10 Celsius degrees) above the vaporization point before you have decent pressure. Of course, one can always warm the canister by various means, and so long as isn't warmed to the point of being too hot to touch, it should be safe while giving one good pressure. 2. Instantly "winterize" your existing stove. With this adapter, you don't have to shell out the cash for a dedicated winter stove. Here's what I mean: Say you're basically a summer camper. Most people are. But every couple of years you get a wild idea and go out when it's cold. A stove is pretty close to a necessity on a winter trip. But do you really want to spend the money on an expensive stove that you're only going to use every couple of years? No, of course not. No problem. Just get this little adapter, and voila! you instantly have a winter capable stove. 3. Outlying areas (no backpacking canisters available). In a lot of outlying areas, specialty items like backpacking canisters may simply not be available. I know guys who have hiked in rural New Mexico where they just couldn't find backpacking canisters, but, walk into a hardware store or gas station, and, there they are: 100% propane car camping type canisters. Having this little adapter might mean the difference being able to do a given trip – and having to just go home. This is particularly true if you have to fly in for a given trip and cannot take canisters from home. You could look at this adapter as $20 worth of cheap insurance. This adapter opens up a whole new fuel supply for your backpacking stove. The ability to boil water for drinking can be critical in times of natural disaster. Another reason for buying 100% propane is that it's typically cheaper. I've seen propane for as cheap as $2.50 (USD) per canister. About the cheapest you'll find for the equivalent amount of backpacking gas is $7 or $8. That's a HUGE price difference. Why? Well, think about it. For every backpacker, there are hundreds of car campers, hunters, picnickers, and back yard barbecuers. The economies of scale just aren't there for backpacking canisters. 6. Trailhead camping – or just using your backpacking stove for everything. You might also want to bring 100% propane to cook your supper and/or breakfast if you spend the night before a backpacking trip at the trailhead. That way, you start with a 100% full backpacking canister for your hike. Or heck, maybe you just want to own one stove, and your backpacking stove is it. You use backpacking canisters when backpacking, but when car camping, picnicking, etc. you just use cheap propane, and who cares about the weight when you're using your car, right? Of course there's no reason that you have to restrict yourself to the big, fat 16.4 oz/465 g propane canister. The 14.1 oz/400 g canisters will work just as well and may be more packable. For a remote canister stove that can handle liquid feed gas (inverted canister type operation), this might be a nice option. Heat the stove up with the canister upright, then when the stove is hot, lay the canister on its side for liquid feed. Really, any fuel canister with compatible threads could be used – but is it a good idea? For example, the little 5.45 oz/155 g Bernzomatic QuickFire canisters appear to be compatible. This has NOT been tested with this adapter or with a backpacking type stove is NOT recommended. Note that the gas contained is NOT pure propane. Bernzomatic QuickFire canisters contain MAPP gas which does have propane in it but also has a high percentage of propylene. Propylene burns at a much hotter temperature than straight propane. What will this high heat do to your stove? I don't know, but I do know your stove is not built to handle that kind of heat. I wouldn't do it, but it's up to you. If you decide to go against my advice, exercise extreme caution with any non-propane canisters. 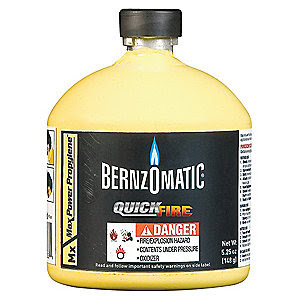 A Bernzomatic QuickFire 5.45 oz/155 g canister of MAPP (high propylene content) gas. This has NOT been tested and is NOT recommended with this adapter. Some of you may remember my post a few years ago on the Kovea propane adapter. The Kovea propane adapter is a great little adapter, but it weighs 105g – that's nearly a quarter of a pound! By contrast, the G-Works adapter weighs 33 g, about 1.2 oz – only about one-third the weight of the Kovea adapter. In other words, the Kovea adapter weighs roughly triple what the G-Works adapter weighs. There is a rim around the threads where your backpacking canister attaches. I used a Kovea Spider stove with my G-Works adapter, and it worked great, but some stoves with a really wide base might not work. The rim around the threads is about 25 mm outside diameter and about 21 mm inside diameter. Again, however, I would not recommend that this adapter be used with any regulator valved stove. The G-Works adapter is made in Korea. Generally stoves made in Korea work well with the adapter if they fit within the rim. I've had reports of some stoves from China where the pin on the stove was too short to open the valve on the adapter. A lot of stoves are made in Korea including some MSR, Snow Peak, and of course Kovea stoves. They're available on e-Bay for about $20 although there may be better deals out there. Amazon is a lot more expensive. Recently, I've reviewed two small upright canister stoves, the MSR Pocket Rocket 2 and the Soto Amicus. Which is the better stove? The Soto Amicus, left. The MSR Pocket Rocket 2, right. I try to be pretty even handed with the brands. If a given brand puts out a solid stove that is reasonably well executed, I'm generally going to give them a good review, but this doesn't mean that they're necessarily my top pick for that class of stove. About the same price – $40 (without ignition) or $45 (with ignition) for the Amicus* – vs $45 for the PR2. Roughly the same weight, 73 g/2.6 oz for the PR2 vs 78 g/2.8 oz for the Amicus. About the same level of compactness and packability. Both have needle valves – as opposed to a regulator valve which can handle cold weather better (see: Canister Stoves in Cold Weather – Regulator Valves and Inverted Canisters). So, which is better? Well, I guess that depends on what one values. The Soto is clearly the more sophisticated, and for the same price*, you get a piezo ignition, better wind resistance, and better pot stability. But the PR2 is dead simple. It's really beefy, and there's little to go wrong with it. It's most vulnerable point is its aluminum threads which can wear out with heavy use. The Amicus has a brass insert which will wear better – but which can still wear out. Note however that there are many people who have done multiple long distance through hikes with stoves that have aluminum threads and have reported no problems. Keep the stove's threads clean. Do NOT set a stove base down in the dirt! Keep the canister's threads clean. You might actually want to keep that little cap. The Amicus is slightly more compact in terms of width and a bit shorter when packed. The Pocket Rocket 2 has a wider span to its pot supports when unfolded, but as I say in my write ups, the Amicus actually has better pot stability with it's four pot supports compared to three for the Pocket Rocket 2. When unfolded, the Pocket Rocket 2 is slightly taller than the Amicus. The MSR Pocket Rocket 2, left. The Soto Amicus, Right. Note spark point on the Amicus' ignition. So, sophisticated with lots of features for the same price – or dead simple? Both are pretty good stoves. One has to decide what is most important to them. For me... probably the Amicus. I really like the improved pot stability and the wind resistance. The piezo is nice too. But I know a lot of people – particularly through hikers who typically want simple, strong, and reliable – are going to go with the PR2. The PR2 has everything you need but nothing you don't. With no ignition, lower price – $40 for the Amicus* vs. $45 for the PR2. With an ignition, the same price but a more sophisticated stove. Backcountry Gear is selling the Amicus with ignition for $45 – but they're including a free cookset in the deal. I've never used the cookset, but for free, hey, why not? Campsaver has the Amicus without ignition for $32 and with ignition for $36. Tough to beat that. Supposedly, if you sign up for their email list, you can get an additional discount. Unfortunately, the PR2 is a new stove just coming out, so it may be a while before you can find discounts on it. I don't think I've ever purchased anything from either of these two sites. They look reputable, but these links do not constitute an endorsement. Friends have bought stuff at Campsaver and had a good experience. I can't say either way. I receive no remuneration posting these links or writing this blog post. I have no financial relationship with either site. I'm not even a customer as of this writing. Considering the above disclosures, you probably have realized that I know a lot about stoves, but I don't know much about making money on the internet, lol. Have a nice day, and get out there.